It was the beginning of the school year, so the teacher and students were still getting to know one another. As Ms. Perez stood in front of her second grade class, she got their attention and announced that she had something important to tell them. It was an instruction of how things go in second grade, information previously unbeknownst to them. Ms. Perez: Now class, I need you to listen because I have something important to tell you. Sophia (happily): That you’re Mexican?! I was speechless when Ms. Perez shared this story with me. Notice how I said speechless and not surprised. This is totally something that my child would do and say. We’re still working on that filter between her mind and mouth — you know, the one that discerns what is appropriate to say and when. As for noticing another person’s skin color and physical features that differ from hers and discussing it, that is par for Sophia’s course, too. Perhaps I should say that it is par for our family’s course. We talked as best we could at their developmental level about diversity, culture, language, and countries and the people who hail from them. 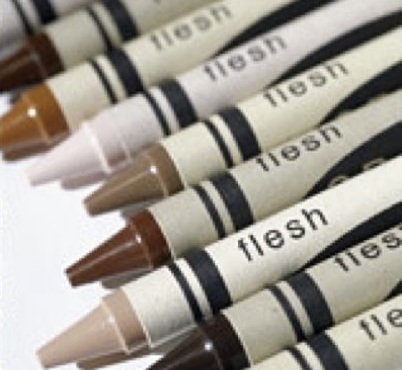 Just as God made the rainbow in the sky with different colors, so God makes people with different colors of skin. All of the colors and people are beautiful, I told them; and people of different cultures have much to enjoy and learn about one another. So Sophia, at the ripe age of 8, came to understand skin color, race and heritage as something important indeed. Such things are works of God in her mind; and God does not make mistakes. If a person is Mexican or Puerto Rican (fill in any nationality, heritage and culture here), she should be happy about and proud of it, according to Sophia. If God made you that way, then that is a good thing because God makes good things. Let’s be friends, you God-created person, you and I is Sophia’s next move. Blessed Ms. Perez didn’t quite know Sophia’s heart or direction at first. When one hears such a question (which was completely unexpected) out of the context of its intention, the possibilities for interpretation are endless. Gracefully, Ms. Perez did not automatically assume the worst about my child. Ms. Perez also informed Sophia that it’s not helpful to make assumptions about people because of their skin color, the sound of their name or for any other reason. I totally agree with Ms. Perez on this one. If you’re curious about someone, ask them to tell you about themselves, their family, their family traditions, etc., Ms. Perez encouraged Sophia. We’ll never know the truth about who someone is unless we build a relationship with her or him. Sophia, Eric and I had a follow-up discussion about this. It was comforting to be confirmed of Sophia’s kind heart. She wanted her teacher to be proud of who she is, she told us. Sophia is not “color blind”, and we do not desire for her to be. What we do hope that we’re instilling in her and her sister is an awareness, appreciation and respect of differences; and an even greater awareness, appreciation and respect of commonalities between humans. Each of us is unique, and that is to be celebrated. We are also all created in the image of God and formed by the hand of the one Creator. Sisters and brothers, brothers and sisters ain’t we everyone, as the 1970s song goes. The ability to embrace differences, similarities and people…now that is something important…something very important indeed.